When it comes to major holiday celebrations, Chicago is always over the top. All summer the city goes all out with major fireworks displays, while during the winter the Windy City is illuminated and the stores have marvelous window displays. This is all signifying that the joyous holiday season has arrived. From the magnificent official city Christmas tree in Millennium Park to the Museum of Science and Industry's "Christmas Around the World" display, there are some holiday highlights guaranteed to bring cheer to all. The spectacular six-car Chicago Transit Authority (CTA) train is an amazing sight with the outside adorned with holiday seasonal images, and interiors decked out with thousands of multi-colored lights, red bows, garlands, and red and green overhead lighting. And, as the train pulls into each station, Santa waves to boarding passengers from his sleigh on an open-air flatcar carrying his reindeer and decorated holiday trees. Also, a 60-foot bus bejeweled inside and out with hundreds of lights and holiday decoration travels through the city. The Sprint CTA Holiday Train travels all 'L' lines in November and December as part of regular rail service. The Sprint CTA Holiday Bus travels nine CTA bus routes in December as part of regular service. Normal CTA fares apply. Christkindlmarket Chicago started in 1996 and has grown in popularity with more than half a million people attending each year. It's the largest German market of its kind in the country, and it aims to stay true to its German roots. More than 70 percent of the market's vendors speak German as well as English. What sets Christkindlmarket apart from other shopping opportunities in the downtown area is that it offers a unique experience. Many of the items are handcrafted and unique. Wares range from hand-blown glass ornaments, nutcrackers, cuckoo clocks, jewelry, toys, clothing and more. Many of the vendors also offer demonstrations of the making of their items. One of the most anticipated attractions of Christkindlmarket is the official Christkind, a young woman from Nuremberg, Germany dressed in traditional holiday attire and commissioned to serve as an ambassador for the event. She will be present throughout the duration of Christkindlmarket and is part of the grand opening festivities. That's when she'll recite a prologue translated from the original German version, to welcome visitors to the Christkindlmarket Chicago. Christkindlmarket takes place November 16 - December 24, 2018. Head to Millennium Park to witness the 105th lighting of the official Christmas tree of the City of Chicago. The lighting takes place on November 16, 2018, at 6 p.m.in Millennium Park at Randolph and Michigan Avenue. The large tree will be trimmed amazing for all to behold. Actor Miguel Cervantes (Alexander Hamilton in Chicago’s Hamilton) will be serving as emcee for the event with music and special guests. Also on hand is Santa's Workshop at the base of the tree. Santa is available every day through Christmas Eve to listen to children's gift requests and for a great photo opportunity. There is also ice skating in the park during the season. Nearby restaurants and bars include Acanto, Chicago Athletic Association Hotel (Cherry Circle Room, Cindy's, Milk Bar, Shake Shack), Chuck's: A Kerry Simon Kitchen, Columbus Tap, The Gage, Giordano's, Mr. Brown's Lounge, Park Grill, Pastoral Artisan Cheese, Bread & Wine, Remington's Restaurant, Seven Lions, Tavern at the Park, and Tesori. Chicagoland's second zoo hosts the largest and longest running lights festival in the area. Get into the mood for the holiday season with decorations of almost one million lights, a laser light show, carolers, storytellers and more. New for 2018 is the Chicago Wolves skating rink. Many of the indoor exhibits will be open for viewing animals, plus there will be "singing to the animals" and special "zoo chats." The zoo's restaurants and food stands will be open with full menus and holiday treats, and gift shops will have hundreds of unique items. The exhibition is included in the admission price to the zoo. Holiday Magic runs Saturdays and Sundays, December 1-2, 8-9, 15-16, 22-23, and Wednesday-Monday, 26-31, 2018. 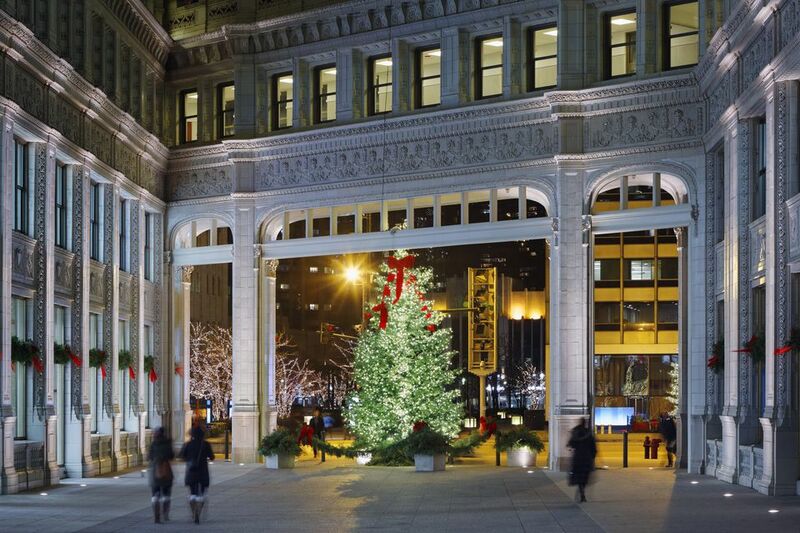 This customized, two-and-a-half hour trolley tour of Chicago is a great way to see all the sights in holiday splendor. Hosted by ​Chicago Trolley and Double Decker Co., the annual event happens throughout the season and takes passengers to various locations, including the Magnificent Mile, historic State Street (home to Block Thirty Seven and the famed holiday windows at Macy's on State), the Loop, Christkindlmarket Chicago and Lincoln Park Zoo's ZooLights. Tours start November 23, 2018. Adding to the festive cheer, the Holiday Lights Tour added a new stop at 50 E. Walton St., visiting Sprinkles Cupcakes’ only Midwest retail location. Sprinkles’ handcrafted, delicious confections will be brought on every holiday trolley and served at no additional charge to each passenger. Through the first weekend of January, the annual exhibit at the Museum of Science and Industry takes a look at how various cultures celebrate the winter holiday across the globe, with performances from multiple dance and chorus groups, as well as more than 50 trees decorated by various cultural groups throughout Chicago. The 45-foot tree in the museum's main hall is decorated with ornaments representing many of their classic exhibits. The event opens on November 15, 2018. Nearby restaurants and bars include A10, Cemitas Puebla, Italian Fiesta Pizzeria, Ja' Grill, Lake Shore Cafe, La Petite Folie, Promontory, Snail Thai Cuisine, and Valois Diner. Every year from the day after Thanksgiving until New Year's Day, the Lincoln Park Zoo decorates the zoo with strings of lights, bright displays, and extends their hours into the evening in celebration of the holiday season. But it's not just about the lights. The zoo provides other Christmas attractions as well such as Santa's Safari, ice carving demonstrations, and a holiday express train. Nearby restaurants and bars include The Blanchard, Hotel Lincoln ( Beermiscuous, J. Parker), Intro Restaurant, Mon Ami Gabi, Naoki, North Pond, and R.J. Grunts). Marshall Field’s flagship store opened The Walnut Room, the first-ever department store restaurant in the late 1890s. Macy’s on State continues the tradition, which includes the famed chicken pot pies and elaborate holiday window displays. In addition, there's Santaland on the fifth floor and the Great Tree in The Walnut Room. Visitors may get into the holiday spirit here early November through early January. The Magnificent Mile Lights Festival returns in 2018 with a full lineup of activities, starting on 4:00 p.m. on Friday, November 16 and then again at 11:00 a.m. on Saturday, November 17. Free events culminate in the grand Tree-Lighting Parade down North Michigan Avenue with grand marshals Mickey Mouse and Minnie Mouse. The 2018 Holiday Activity Guide, includes an event map, a schedule of events, and special offers around The Magnificent Mile shopping district. Nearby restaurants and bars can be located using this guide to eating and drinking on the Magnificent Mile. Held at Navy Pier, the WinterWonderfest is considered the city's biggest indoor winter playground, featuring 170,000 square feet of rides, giant slides, and an indoor ice skating rink. The events run November 30, 2018 through January 6, 2019. Tickets can be purchased online.